In Lipstick City, Chicago drag royalty Shea Couleé plays a wronged woman bent on revenge. Queens of color feature prominently in her film, a clubby, fast-paced visual romp. 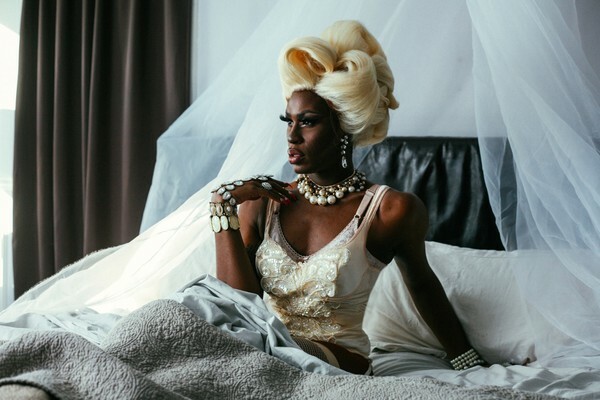 Last Friday, the Logan Center held a screening of the elusive 1968 documentary The Queen, followed by the experimental 2016 digital short film “Lipstick City.” In attendance were Shea Couleé, a notable contemporary Chicago drag queen and the writer-star of “Lipstick City,” and Marlow La Fantastique, a Chicago drag queen from the ’50s and ’60s who features as the contestant Miss Chicago in The Queen. After the screenings, Shea gave a wonderful and excellently received lip-sync performance of Janelle Monáe and Erykah Badu’s “Q.U.E.E.N.,” which was followed by a Q&A session with the speakers. Nicole Morse curated the event as part of the Film Studies Center’s Graduate Student Curatorial Program. A well-known artifact in drag culture, The Queen has remained invisible to the public eye. Until very recently, the film only existed on two 35mm copies. Despite this inaccessibility, The Queen has persisted over the years as a sort of legend of the drag culture of yesteryear, surviving in short iconic clips and memetic quotes floating around in queer media; during the Q&A session, Shea told Marlow she frequently references the scene where Crystal Labeija shouts, “I don’t say she’s not beautiful, but she wasn’t looking beautiful tonight!” Distribution efforts in 2014 resulted in the first DVD copies of the film legally authorized for the public, allowing for Friday’s screening to take place. Directed by Frank Simon, The Queen provides an unparalleled look at the Miss All-American Camp Beauty Pageant, a “female impersonation contest where gay men compete—complete with swimsuit, eveningwear, and talent portions. The camerawork is never direct or confrontational, inviting us backstage as voyeurs, gazing intimately at making-up, drama, and conflict. A clandestine queer culture becomes incredibly immediate—a few audience members could be heard applauding when Marlow La Fantastique took the stage as one of the top five queens. Underpinning the experience of the film—and the general conversation of the evening—is a critical exploration of how people of color carved spaces in drag culture, as well as the roles their presences played in the dynamic of this underground scene. In a lengthy scene, Crystal Labeija, a black queen competing as Miss Manhattan, rails against the competition for crowning Miss Harlow—a young white competitor—despite her obvious inexperience and lack of polish. “You know she didn’t deserve it,” Crystal hisses. “She doesn’t equal me—look at her makeup! It’s terrible!” The camera flashes to Harlow, downcast, wearing neither nails nor earrings. Crystal’s diatribe is not without a very real social context. Even in the hospitable world of drag culture, many queens of color have historically felt excluded, unfairly treated, and even attacked, both by the public and by their fellow queens. With this experience in mind, Shea Coulée went about creating “Lipstick City” with an experimental narrative structure that places her and fellow queens of color at its center. In one scene, Shea’s character must enlist the aid of Chic, an underground ringleader played by Korean queen and RuPaul’s Drag Race finalist Kim Chi, to teach her unfaithful husband a lesson. Produced with splashy colors, vibrant sounds, and truly sickening looks, “Lipstick City” is an incredible 10-minute short film that attests to the promise of diversity in queer culture.